In November 2012 a standardised European tyre label has been introduced: the EU Tyre Label will provide information on the environmental and safety characteristics of a tyre based on three standard criteria. Τhe aim is to increase traffic safety and reduce fuel consumption. The wet grip properties are set out in classes A to G, although D and G are not used. At a speed of80 km/h, the difference in stopping distance between A and F can be as much as 18 metres. The impact speed between A and F is up to 49 km/h higher. A collision at just 25 km/h can cause injury. The rolling resistance is classified in classes A to G, although D is not used. If 6.6 litres of fuel are consumed per 100 kilometres, improvement by one class corresponds to a fuel saving of between one and one and a half litres over a distance of1,000 kilometres. 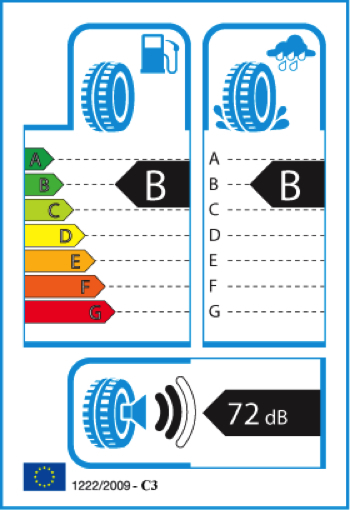 The greater the number of bars filled in, the louder the noise emissions from the tyre in relation to the maximum permissible value (in decibels) for external rolling noise. The greater the number of bars filled in, the louder the external rolling noise from the tyre. The external noise is measured in Decibels.